Flights to Lanai only come from the Honolulu Airport, and, to my knowledge, they are only flown by Hawaiian Airlines. The flights are rather reasonably priced, ranging from $75 to $85. If you find yourself on Maui, rather than on Oahu, you can take a ferry from Lahaina, Maui to Manele, Lanai. However, do not plan to fly to Maui and then go straight to the ferry, as the logistics of this are quite difficult. First of all, the Maui airport is in Kahului – which is a solid 40 miles from Lahaina. If you are renting a car on Maui, that can work. If you are not, that’s about an $80 Uber ride. Also, if you plan on staying the night on Lanai, having a rental car sit overnight (or over multiple nights) on Maui may not be the most cost-effective thing to do. In other words, are you going to spend multiple nights on Lanai? Take a flight from Honolulu. Are you hoping to just spend a few hours on Lanai as a daytrip from Maui? Take a boat. Not sure how long you want to spend there? Keep on reading. In my opinion, Lanai is a daytrip sort of island. You can definitely see all of the best things to do on Lanai in six hours or so. However, if you are looking for somewhere very off-the-grid to relax, there are a couple of options for you to spend a few nights. This ocean front Four Seasons property provides guests with two pools, a spa, fitness facilities, tennis courts, a shopping area, and a few restaurants. Prices start at $1,050/night. Located within Lanai City, the Four Seasons Resort Lanai, The Lodge at Koele has a very different vibe from the other Four Seasons property on the island. Spa treatments, locally-sourced healthy meals, and customized fitness programs take priority at this resort. The Four Seasons Resort Lanai, The Lodge at Koele is currently closed for renovations. It will reopen in early 2019. If you’re looking for a hotel with more of a local feel, Hotel Lanai is the place for you. With Hawaiian quilts and plantation-style décor, it is unlike any other form of accommodation on the island. Hotel Lanai is temporarily closed at this time. It is not currently taking reservations. Even on this very small island, Airbnb is still an option. There are a total of eight Airbnbs on the island at the moment, which range from $89/night to $1,500/night. Here are some tips to find an amazing Airbnb. Let me be very clear about this: there is no other option but to rent a car on Lanai. There is no public transportation, no taxis, and practically no Ubers (although I did happen to open the app once and find a single Uber). 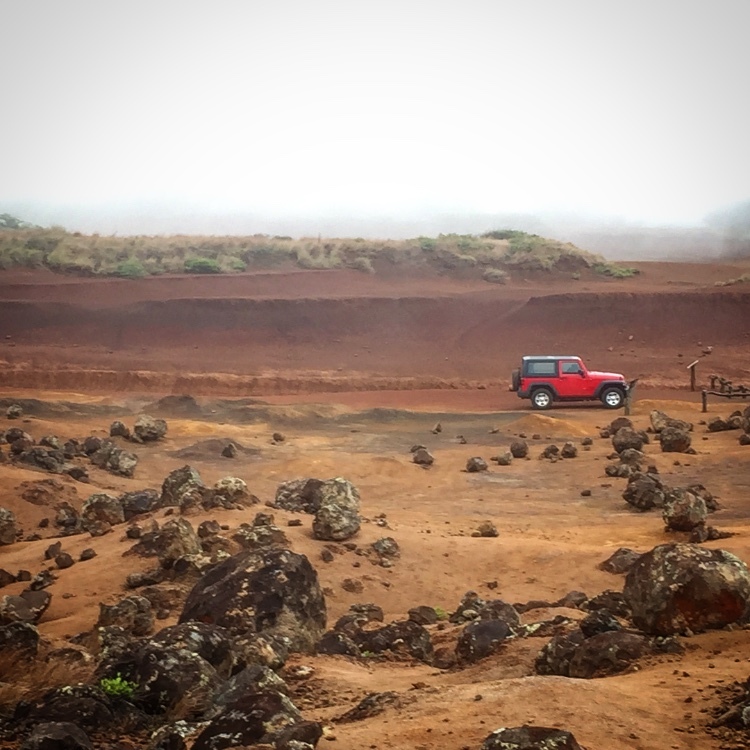 Additionally, if you plan on doing even half of the best things to do on Lanai, you’ll need to rent a four-wheel drive (as mentioned before, Lanai only has thirty miles of paved roads). I found two places to rent cars from on Lanai: Dollar and Lanai Cheap Jeeps. Despite the name, the prices are pretty much the same ($150/day – I know, very expensive, but they’ve got to survive on this small island). On our trip over, we chose to use Dollar, and there was a small hidden fee of $10/person for transportation to and from the airport and/or ferry port (as they are located in Lanai City, rather than either of these places), which was quite the bummer. I do not believe Lanai Cheap Jeeps has this hidden fee. However, Lanai Cheap Jeeps is cash only, whereas Dollar accepts credit and debit cards. If you do happen to be staying at one of two Four Seasons resorts on the island, there is a free shuttle service from the airport and into Lanai City. So What Exactly Are the Best Things to do on Lanai? If you’re like me, you’re all about the unique. I’m not about to tell you to go horseback riding or try your hand at archery. No, you can do that anywhere. The best things to do on Lanai are the things that you can’t do anywhere else. One of the best things to do on Lanai is the Garden of the Gods, also known as Keahiakawelo. (You’ll need to know this Hawaiian name if you’re going to have any success finding it, so remember it or screenshot this page.) 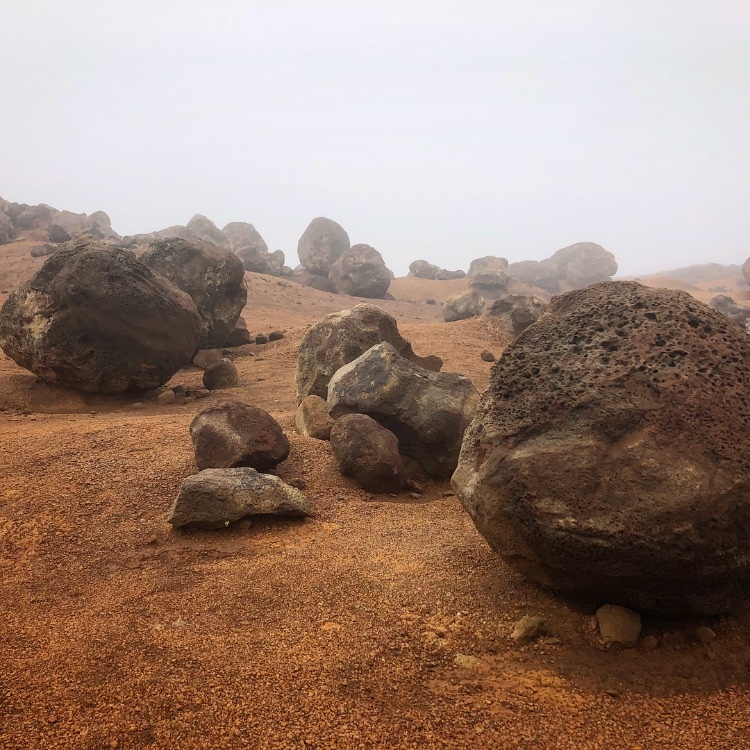 This rather barren, foggy landscape of haphazardly placed round rocks and bright orange swatches of dirt creates a sacred, untouched landscape that is unlike any other. A four-wheel drive is required to get to this stop. For more information on the Garden of the Gods, check out this post. Continue on past the Garden of the Gods to reach Polihua Beach, another untouched portion of Lanai. This stretch is sand is also one of the longest across the entire Hawaiian Island chain, despite the fact that it is on one of the smallest islands. This secluded beach is also perfect for just lying on the sand, although not for swimming as the waves can be quite violent here. A four-wheel drive is also required for this stop. Shipwreck Beach is a beach on the West coast of the island of Lanai, where over a dozen ships have sunk. One particular one still manages to stand above the surface of the water. While we did try to reach Shipwreck Beach while we were on Lanai, our attempts were unsuccessful. But we’ve learned from our mistakes (and asked some locals when we returned our car), and now I will share what I’ve learned. A good chunk of the road to get to Shipwreck Beach is paved. When the paved road ends, you’ll make a left and drive for a long while on an unpaved road filled with divots and deep tire tracks for your vehicle to fall into. At one point, there will be a sort of opening on the right where you can see a decent chunk of sand and the nearby ocean. (If you pull up Google Maps, it’s just around where the road ends – fun fact: even if you don’t have service, Google Maps can still pinpoint your location.) If you’ve gone up a short section of unpaved road that is quite steep, you’ve just passed it. Park your car there. Head to the shoreline and walk for another 30 minutes to the left. Then, you should see the famous shipwreck of Shipwreck Beach. If you do manage to make it all the way to the shipwreck, rumor has it that there are some Hawaiian petroglyphs (ancient Hawaiian drawings) nearby. 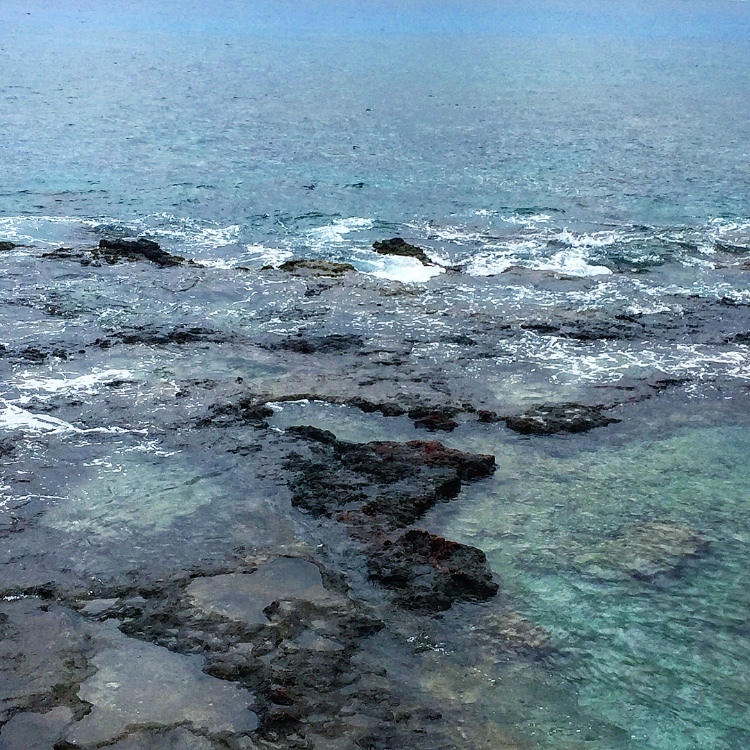 Puu Pehe is one of the most recognizable spots on Lanai. The red-orange cliffs contrasted with the deep blue of the water make quite the picturesque scene. To get to Puu Pehe, drive to Hulopoe Bay. On the left side of the beach, there will be a little peninsula. Follow the trail on the peninsula until you see Puu Pehe. Down below (or just to the left of the frame of the image above), you will also get a glimpse of the stunning “Shark’s Bay”. But why exactly is it called Sweetheart Rock, you ask? As with most places in Hawaii, it goes back to a Hawaiian legend. (It’s quite a depressing one, so skip this paragraph if you’re not feeling like a sad story today.) A young warrior from Lanai went to the nearby island of Maui and saw a gorgeous princess. He captured her, took her to Lanai, and made her his wife. Because he was afraid that other men would fall in love with his princess, he hid her away in a sea cave. But one day, there was a violent storm, and the princess drowned. So, in true Romeo and Juliet style, the warrior killed himself by jumping off the cliff. Not the happiest of stories, but it does have a great view. Also, a four-wheel drive is NOT required to access this stop. Want to find out more about Sweetheart Rock? Aloha with Love has a little more information on it. One of the most unique things to do on Lanai is the Lanai Cat Sanctuary. This nonprofit is home to over 600 cats, and it helps both the cats and other endangered animal life on the island. By giving the cats a new home within the borders of the sanctuary, it gives them a comfortable life without them having to prey on the endangered birds of Hawaii. It’s a win-win for everyone! You can adopt or sponsor a cat at the Lanai Cat Sanctuary. A four-wheel drive is NOT required to access this stop. Where Can I Grab a Bite to Eat Between All These Fantastic Things to do on Lanai? Once again, options are limited. There are only a dozen or so places to find something to eat. If you’re hoping for a local spin, Blue Ginger Café is the place to go. Be warned though, Hawaii’s local food might not be everyone’s cup of tea. If you’re looking for something a little more familiar, head to the Four Seasons Resort Lanai. Nobu, Malibu Farm, One Forty, and the Sports Bar & Grill are all located on the property. If you’re looking for a market to grab something quick, there are only two on the island: Richard’s Market and Pine Isle Market, both of which are in Lanai City. Take your pick. Phone service on Lanai is VERY spotty, particularly outside of Lanai City – and that means Google Maps is very spotty. While there are very few roads on the island, if you’re like me, you will still manage to get lost. So download the map of Lanai on Google Maps ahead of time! To do so, simply type “Lanai” into the search bar, click on the white section at the bottom of the screen, and click the download option that comes up! Make sure you’re on Wi-Fi as it downloads, and keep the app open to have it download faster. Also, a local told us while we were there to make sure to follow all traffic laws (so that pesky speed limit and making a full stop at stop signs), because the police can be quite strict. Don’t want to add a ticket to that already quite heavy rental car bill! Have you ever been to this tiny island gem? What do you think are the best things to do on Lanai? Tell me about your experience in the comments! Did this inspire you to plan a trip to Lanai? Pin these tips for later! Absolutely gorgeous!! Hawaii has been on our bucket list for a long time and we will definitely add Lanai to that list! Thanks for the great guide! Of course! Glad I got to share this little gem with you! This island looks like a totally different world! Those boulders are strange looking! It really feels like it! While we were there, there was no one else at the garden of the gods! It was kind of crazy. Garden of the gods and sweetheart rock look great. Thanks for the post. Lanai looks like a great place to go. Those were my two favorite stops!! I know! I was shocked too!! But I guess that’s the price to see such a beautiful island. Looks great and it is so nice to get some tips on less touristy places in Hawaii. Seems like the perfect heaven if you want to get an off the beaten track experience! I’m definitely all about the less touristy places :). Ooh! I hope they get to stop by Lanai! That would be such an amazing experience for them! Hawaii seems to be such a dream ! Thanks for sharing some recommendations on lesser known places, it is always useful !!! Thanks for reading about them :). I want to visit Hawaii and it is great to learn about somewhere I had not considered visiting before (or heard of) Pinned! This would definitely be a completely different Hawaii experience for ya! This place is not only gorgeous but seems so tranquil too. I have been wanting to go to Hawaii but never thought about Lanai, but this is pushing Hawaii a little higher on my list. That’s the appeal of Hawaii – always climbing up that bucket list :). Lanai looks wonderful! I’ve wanted to visit Hawaii since I was tiny, and quieter places definitely appeal to me more – thanks for sharing the tip! Yay! Glad you found some travel inspiration from this post! That’s awesome! Lanai can be a fun day trip for ya! The place looks great. Amazing photos! During that time when I was living in the States I got to visit 45 states but never went to Hawaii. So much beauty exists in one place, unbelievable! 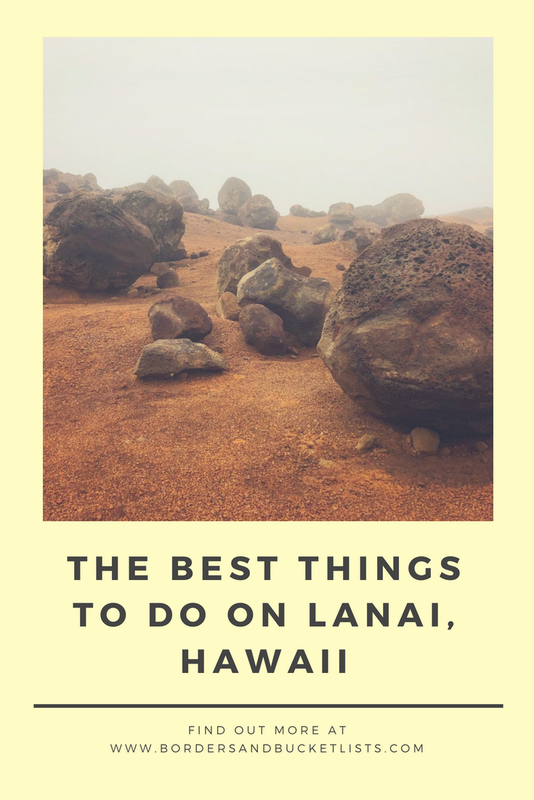 I’m going to add Lanai to my list too, haven’t really heard about it before! Woah 45 states?! I’ve lived here basically my whole life, and I don’t even think I’ve broke 20!! And yeah, Lanai should definitely be added to your list – it definitely manages to swoop under the radar for the most part. Lanai is not an island I read about often. It’s sad that it so often gets missed by travelers, but I guess that’s part of its appeal too. It sounds like a great place to go a bit off the grid for a few days! Yeah, I think its a combination of people have never heard of it and people don’t wait to go without the luxuries of roads and cell service lol. Hawaii has been on my bucket list for quite some time now. Of-course, I am married for only 9 months now and we surely will go to Hawaii soon and add Lanai to that list! Yay! Glad I could add to your itinerary! So beautiful! This is an amazing guide, can’t wait to go now! 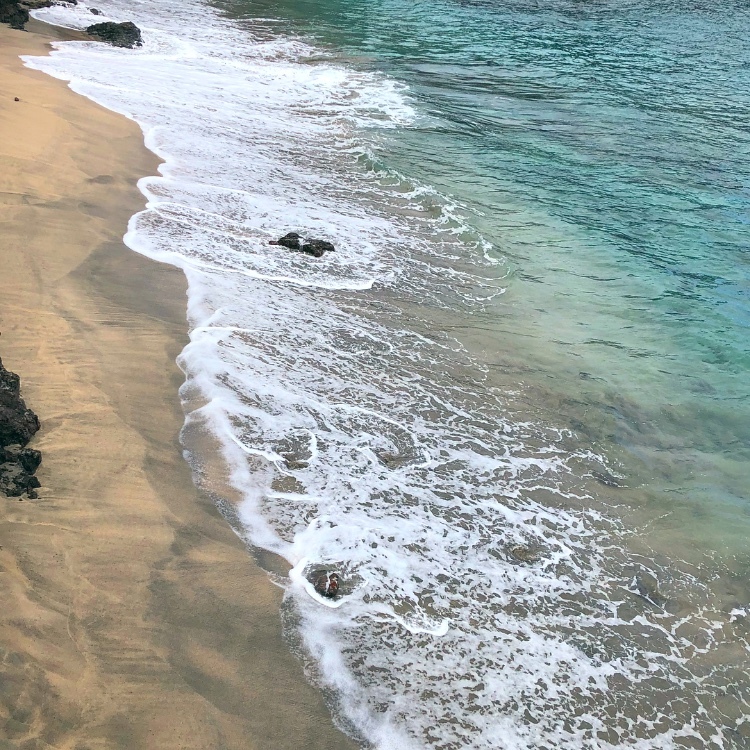 Puu Pehe and Shipwreck Beach are definitely top on the Lanai list – both are so beautiful!! Very interesting read. We are planning a trip to Hawaii for next year and still don’t know, which Islands to visit. Lanai has not been on my radar so far. Thanks for giving me some ideas about this island. I’m glad I could help. If you still need a few tips on how to decide which islands to go to, I have a post about it. 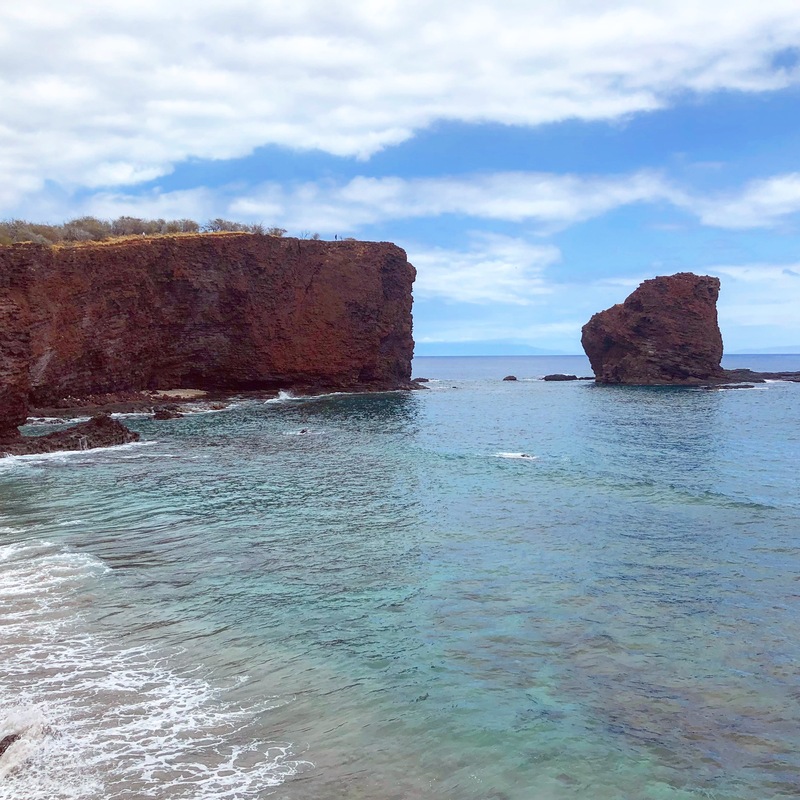 I think one must be adventurous when exploring Lanai specially going to the Shipwreck Beach. It’s funny how you described the road, it definitely sounds like an uncharted territory. Were you able to meet that lone UBER driver? Oh, one must DEFINITELY be adventurous if exploring Lanai lol. LOL I should’ve requested that Uber driver just to meet him or her!! Gorgeous! I love Hawaii and your photos make me miss it so much! Although, I have yet to visit as an adult. I’ll have to add Lanai to my list of places to visit there! It’s definitely worth a stop! Lanai has been on my list forever! I just really wish you didn’t have to rent a car — I haven’t driven in years and am not sure I’d be comfortable driving on roads that you need a 4×4 for! Honestly, just take you’re time and you’ll be fine :). This would definitely a fun stop to add to your trip! Hawaii’s got a bunch of hidden secrets that you’ve got to dig for. Snoop around the blog a bit, and you’ll find some. This post should help you start! 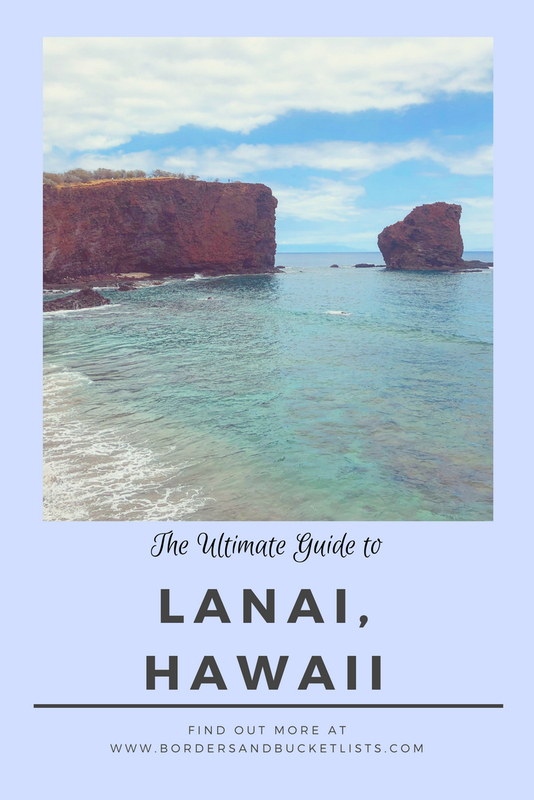 Sarah, thank you for your very specific tips on visiting Lanai, especially exactly the best way to get there depending on the length of your stay.The prices of various accommodations that you showed are also super helpful. I love the insider tips! Thanks so much! Glad you thought it was helpful!